Congregation Emeth maintains the only Jewish cemetery in the South Valley. Gan Emet (Emeth Gardens) lies on the grounds of Gavilan Hills Memorial Park in Gilroy. In accordance with Jewish tradition, a fence separates Gan Emet from the rest of the cemetery. Gan Emet is landscaped with trees and grass. Congregation Emeth’s Holocaust memorial, honoring the memory of the innocent who perished in war and persecution, was dedicated in 2002 on Holocaust Memorial Day and is part of Gan Emet. 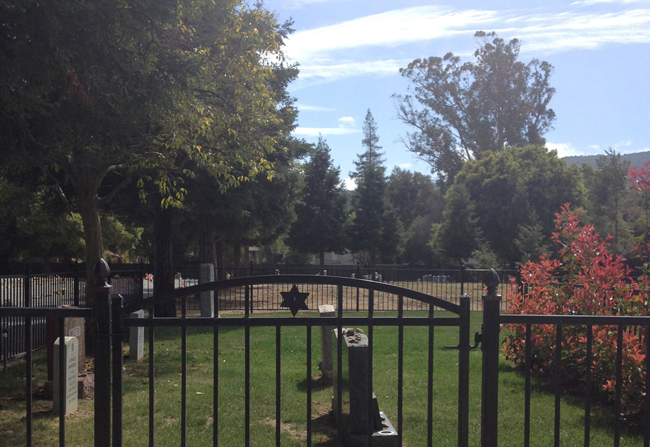 Gavilan Hills Memorial Park, at 1000 First Street, is owned by Habing Funeral Home. As part of the arrangement for Gan Emet, Congregation Emeth’s Ritual Committee and Rabbi Israel offer the required services when a loved one has died. The committee and rabbi also regularly check Gan Emet to confirm Jewish standards are maintained. Preselecting burial plots and purchasing them in advance are a gift one gives to one’s survivors. Gan Emet can accommodate single- and double-depth burials. Cremation is an option. One does not need to be affiliated with Congregation Emeth to be buried or arrange a burial at Gan Emet. Read a news article about significant enhancements made in 2013 to our Jewish cemetery. Read more about Gavilan Hills Memorial Park. To schedule an appointment, view a site map, discuss prices, or assist in plot selection, please e-mail ritual@emeth.net or call 408-778-8200.